Arleen Auger, Helen Donath, Ann Murray, Hildegard Laurich, Doris Soffel, Adalbert Krause, Wolfgang Schöne. Gachinger Kantorei, Bach-Collegium Stuttgart Helmuth Rilling. Hanssler Classics CD92.038 69m ADD. 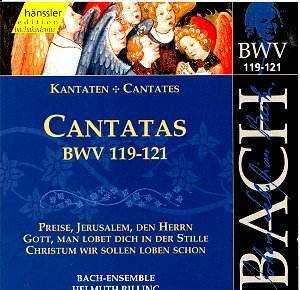 This CD groups three of Bach's most imposing cantatas with the scoring frequently including trumpets and timpani. 'Praise, O Jerusalem, The Lord' is full of inspired writing for choral forces and the effect is extremely moving especially in the six minute long opening chorus. The arias are extremely short and another chorus also contains special parts for trumpets and timpani. The concluding chorale is also extremely beautiful in its simplicity and spirituality. 'God we Praise Thee Now in the Stillness' is also extremely involved with material that reappears in the later more exultant B minor Mass. Indeed the cantata begins with an eight minute aria that includes some wonderful parts for oboe d'amore followed by a sprightly chorus that is the 'Et resurrexit' from the latter Mass. Here I enjoyed Rilling's forthright direction that gives much emphasis on staccato and rhythmic buoyancy. The other cantata, 'To Christ We Should Sing Praises Now' is shorter but includes a beautiful aria for bass that is ably sung by Wolfgang Schöne. Indeed all the soloists are deeply schooled in Bachian interpretation no doubt garnered from their part in Hanssler's voyage through the complete cantatas; the only extant integrale in the catalogues. Hanssler's remastering has greatly improved the original recordings and this particular volume will be pleasing to those who prefer Bach in celebratory mood.